You don’t want to miss this beautiful home located in the desirable “Shady Creek” Community in South Riverview!! NO CDD FEES!! Your buying power JUST went up! Low annual HOA dues! WELCOME HOME to this newer LENNAR Home! Energy Efficient all the way with 4 bedrooms, 2.5 bath, 2 car garage ... just waiting for you! Light and bright kitchen w/ center island is open to the breakfast nook and family room and will give you ample space to entertain and in addition you also have a formal dining & living room as well. The kitchen features a Stainless Steel Dishwasher and Refrigerator and a white GE Range and Microwave. Then head upstairs to enjoy your spacious Master Bedroom and Master Bath that features double sinks, a garden tub and walk in shower, and a large master walk in closet. In your additional bedrooms you have plenty of space as well and they too feature nice spacey closets. Plenty of windows make this home light and bright throughout. The large 4th bedroom could also be a great space to play in or serve as a "game/movie room" the options are endless. The laundry room is conveniently located upstairs. The oversized back yard has no rear neighbors and has plenty of space. The large covered lanai has plenty of room to entertain or just relax after a long day of work. 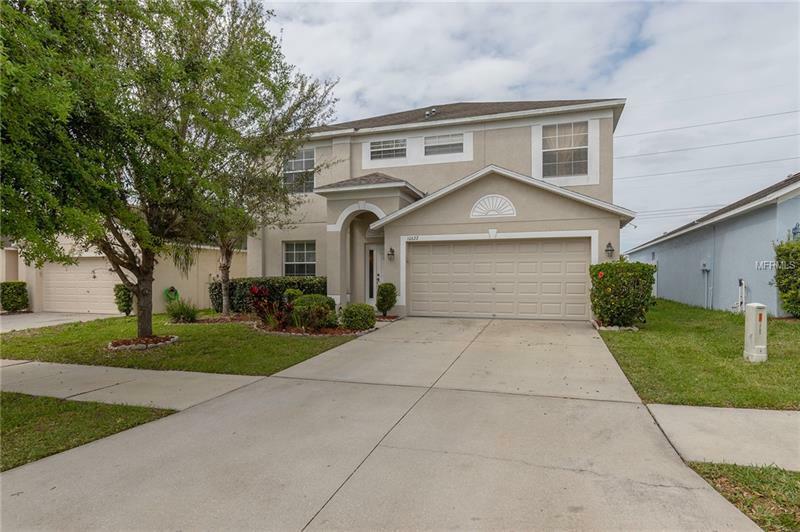 This house is centrally located, very short drive to Tampa, St Petersburg, Sarasota and the best beaches in the area, near to major highways, shops, restaurants and entertainment. Schedule your Showing TODAY!